Bayonetta Xbox 360 Selling Out? Kotaku columnist Tim Rogers brings word that store after store in Tokyo is selling out of the Xbox 360 version of Bayonetta. But why? The Xbox 360 version was awarded a perfect 40/40 score from Japanese game mag, while the PS3 version was not — it received a 38/40. The above picture is from the Yodobashi Camera in West Shinjuku. The tag on the game (完売しました) means "Sold Out"
Tim says the same sell-outs were visible at other Yodobashi branches as well. 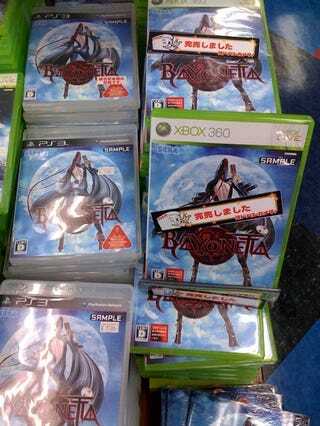 There could be several reasons for this, one of which could be that fewer copies of the Xbox 360 version were ordered by shops unaware that the Xbox 360 Bayonetta was the lead platform. Or maybe lots of people are buying it.